NEW YEAR’S RESOLUTION UPDATE: I CAME, I ATE, I SAW FROGS JUMPING - What About Watermelon? Six months ago, as has become my annual tradition, I made a New Year’s resolution to tackle something on my watermelon bucket list. This year’s goal: to compete in a watermelon-eating contest. The 26-week process of completing this resolution has been fun, to say the least – from choosing a contest to compete in, to interviewing a professional competitive eater, to practicing at home in preparation for the big day. 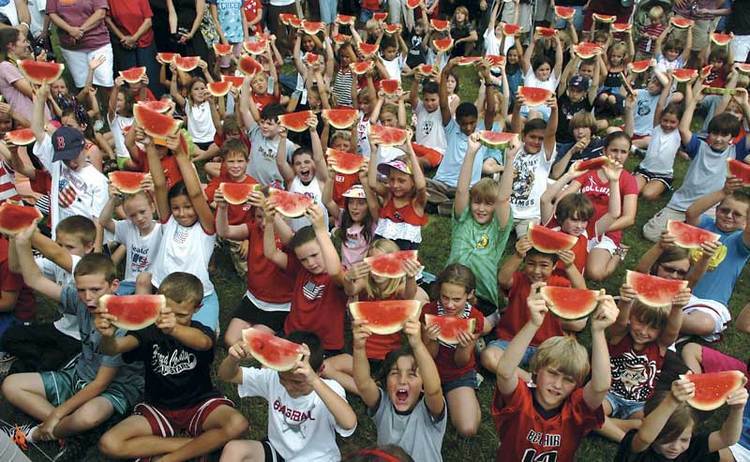 The watermelon-eating contest I took part in was an annual tradition at the Bel Air 4th of July Festival in Bel Air, Maryland (about 90 minutes from where I live). But I wasn’t there for the frog jumping contest in Shamrock Park; I was there for the watermelon-eating contest in Shamrock Park. After adding my name to the list of participants in the 17-and-older category, we took a stroll around the crowded and festive park to kill some time before my competitive eating showdown began. After a countdown from 10 – which seemed like it took three full minutes – the eating had begun. About 17-and-older contestants were clustered together and the 20 of us created quite the symphony of chomping and slurping sounds. And almost as quickly as it had begun, the contest was over. A gentleman from Forest Hill, Maryland was declared the winner, and boy did he ever do a good job of eating that wedge right down to the rind. I’m not 100 percent sure where I finished – probably fourth or fifth – which isn’t too bad. I’m happy with that performance. I had a lot of fun preparing for the contest and you can be sure that I’ll be back again next year to take another shot at the watermelon-eating title!